UPDATE 4.10pm: THE management of Multiquip, owners of a truck involved in a rollover on Ballina Road, Goonellabah yesterday, has released a statement. The statement reads: "Multiquip wishes to publicly thank the witnesses who assisted our driver in the aftermath of yesterday's accident". "Our driver was taken to Lismore Base Hospital, where an extensive examination revealed he had only suffered soft tissue damage, and he was released last night and is now recovering at home. "Many of our staff attended the site, including our qualified accident investigator, to assist emergency services and RMS recover as many live chickens as possible (which were taken back to a farm), and then recover the prime mover and trailer. "We have technicians currently working on recovering the data from the onboard safety systems that the truck was fitted with, including 2-way facing cameras in the cab of the prime mover. This will take some time to be decoded and analysed. "Preliminary investigations seem to be pointing toward a combination of the bad weather, and the camber changes on the road concerned as being contributory to the cause of the rollover. These concerns are echoed by the Mayor of Lismore, Mr Isaac Smith. "Multiquip takes the safety of our employees, and animal welfare very seriously and have training systems in place in conjunction with the latest high-tech safety equipment aboard all our trucks around the country. This type of incident is rare, but will be used to further enhance our safety systems, and operational procedures." They said no further public comment will be made. 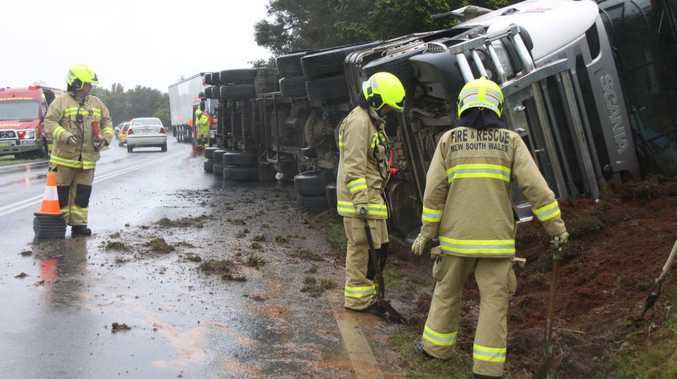 UPDATE: A REPRESENTATIVE from Multiquip Transport said the firm appreciated the assistance from the witness who helped their driver after his chicken truck crashed on the Bruxner Highway at Goonellabah on Thursday. "The driver has been with our company for quite some time and his driving history with Multiquip has been very good," he said. "All Multiquip vehicles carry sophisticated on-board monitoring systems to observe driver behaviour and fatigue as well as truck location and speed and our investigators will recover this information and will be working with RMS and police to ensure we understand what caused the rollover." Lismore mayor Isaac Smith said he was very disappointed to see another truck roll over at exactly the same spot as 10 months ago. "I have contacted Thomas George to get action on this spot of the Bruxner Highway as the intersection on Sunrise Crescent has always been dangerous and now two truck crashes," he said. Meanwhile a representative for the People for the Ethical Treatment of Animals (PETA) Australia Emily Rice said the incident was terrible. "Animals raised and killed for food suffer from the day they're born until the day they're loaded onto trucks for the terrifying journey to the abattoir, where their throats are cut - sometimes while they're still conscious," she said. "The suffering of the chickens aboard the truck, and millions more around the country, is entirely preventable if we choose vegan meals." The Bruxner Highway was finally reopened to traffic at 7.30pm last night - about 10 hours after the incident happened. UPDATE 10:45AM QUICK thinking citizens assisted the injured driver of a semi-trailer carrying a load of poultry when it rolled over on Bruxner Hwy shortly before 9am on Thursday morning. The driver, who appeared to be in his late 50s, was rescued by Chris Copas and Nelson Shipway-Thornton who immediately ran to the rolled vehicle to render assistance. Standing in the rain, Mr Copas who works at the RSL retirement home Chauvel Village, said the pair witnessed the incident. "He was only going slowly, and I ran across the road to help," he said. "We had to get him out with diesel everywhere." Mr Copas and Mr Shipway-Thornton then climbed up the side of the overturned vehicle and managed to open the door to find the driver too shaken to speak. "I got to the truck and we had to find a way to rescue him, so we climbed up on top of the truck and opened the door and started pulling him up… and he fell to the bottom (of the cabin) when he released his seatbelt," Mr Copas said. "We then got him out and some other people looked after him." Once the pair had helped the driver out of the vehicle, a woman who said she had an occupational first aid qualification took charge and cared for the driver, who was suffering from shock and abrasions, until paramedics were on scene. As police closed traffic in both directions, an ambulance crew assessed the man and took him to Lismore Base Hospital. Fire & Rescue NSW were also on scene with their Hazmat van to ensure the diesel spill was rendered safe. Several white chickens had emerged from the rolled vehicle and a firefighter could be seen gently removing one from the road and placing it on the grass beside the truck. Chris who was driving a semitrailer behind the rolled vehicle also witnessed the incident. "We were coming around... he wasn't driving fast it just went on him," he said. "He was going very, very slowly." The semi-trailer, which carried a Multiquip Transport logo, rolled to the left hand side of the road leading out of Lismore. Richmond Police District acting chief superintendent, Toby Lindsey, said he was pleased locals stopped and helped to render assistance. "It's always pleasing when members of the community to stop to render assistance," he said. "Looking at the collision site at the moment, it will be closed while police investigate and NSW Fire & Rescue render the scene safe." Acting Insp Lindsey pleased with drivers to take extra care and drive to the conditions. An Ambulance NSW spokesman said they were called to the incident at 9.01am. "The driver, who is aged between 55 to 65 years, was conscious and breathing and has been taken to Lismore Base Hospital," he said. UPDATE 9.25am: THE driver of a truck carrying a load of chickens that crashed on Ballina Road has been taken to hospital after being attended to by ambulance. A passersby initially administered first aid until emergency services arrived..
Police are on scene and fire brigades are on scene to aid the clean up. Chicken truck crash 2: A truck carrying a load of chickens rolled on Ballina Road at Goonellabah. Original story: A TRUCK carrying a load of chickens has rolled on Ballina Road. The incident occurred near the intersection of Sunrise Ct in Goonellabah. It is believed some chickens have died in the crash. A similar truck crash occurred at the same spot in November last year.